The Tasco 114mm Spacestation Reflector ST Newtonian telescope is a good choice for serious beginners and intermediate amateur astronomers. Its 4.4" diameter is regarded as excellent for light collection. When you are looking for faint sky objects such as clusters and nebulae, large aperture is an important factor to consider. The 114mm Spacestation Reflector ST features coated glass optics, and is capable of producing crisp and bright images of the moon and the planets. 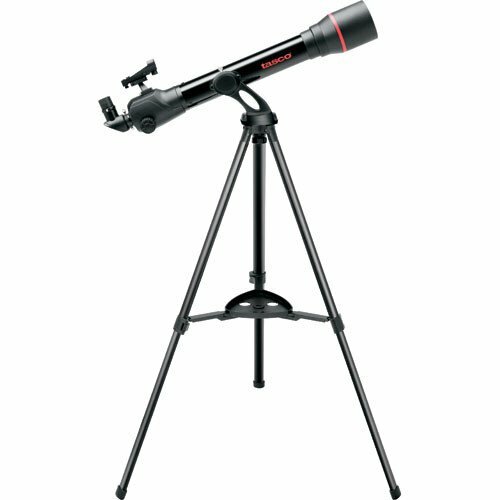 This unit is featured with an altazimuth mount and a rugged, pre-assembled tripod for your viewing pleasure.